"One Man Band - Live" is a one man musical act from Little Rock, Arkansas. This talented vocalist/guitarist/DJ has created a virtual party machine. "One Man Band - Live" performs with real live backing tracks made by real musicians. He sounds just like a real four or five piece band with only one musician performing. Not only does this act sounds great, you can put the "One Man Band - Live" in a small area or venue and have a full sounding live band. "One Man Band - Live" is affordable for everyone's entertainment budget! So, if you're planning a special occasion such as a wedding, company function, public event or a private party. 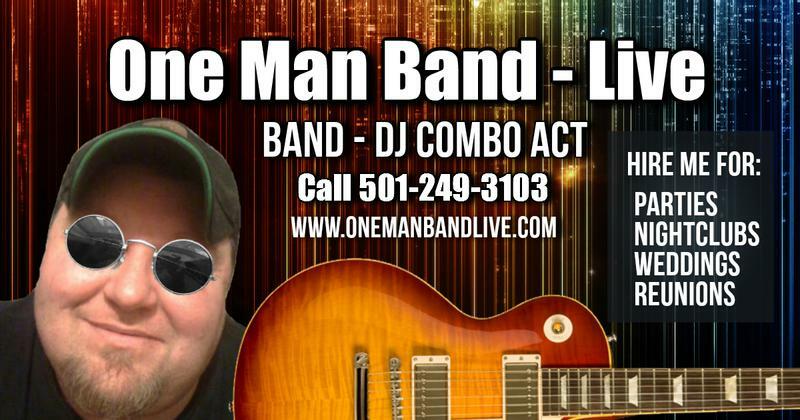 "One Man Band - Live" is a great choice for an affordable live sounding Arkansas band and he also DJs your event. "One Man Band - Live" prefers to perform the most popular classic rock, dance, country, blues, top 40 and R&B classic hits we all love to dance and sing too! Will This Performer Appeal To My Guest? The answer to that question is most events have a difference in age groups from young to seniors. Most live bands perform a certain genre or an era of music. "One Man Band - Live" performs music from different genres and eras, creating a vast listening audience from young to old keeping everyone entertained during your special event. Does The Entertainer Provide Other Music? Yes, not only does the "One Man Band - Live" perform live music for you and your guests. "One Man Band -Live" also provides DJ music and lighting for your dance floor to keep the event fun and entertaining! You also, get to pick all of the DJ music for your event and "One Man Band - Live" will MC & DJ for your guest during the times he takes a break from performing live. How Do I Pick The DJ Music? When Hire "One Man Band - Live" you will be sent a login and password for some free online tools. Which you can then select all of your music from a library of over 250,000 songs. After you select your music, you can submit your selection to the entertain with one simple click of a button.